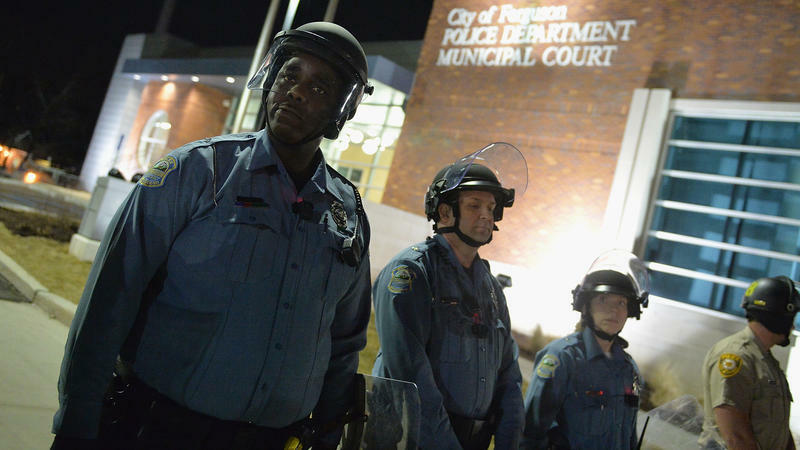 A Justice Department study indicates the "Ferguson Effect" may play a role in the rising murder rate in many urban areas. 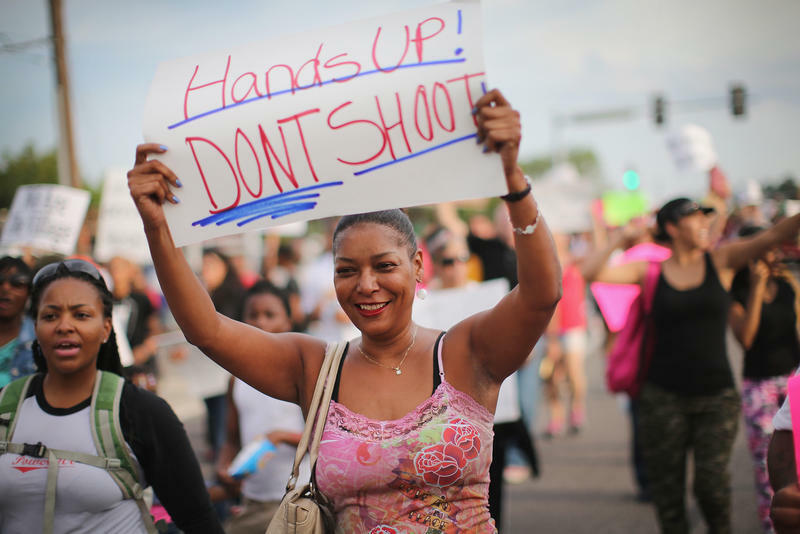 The effect, which refers to the 2014 police shooting death of an unarmed black man in Ferguson, Mo., represents a breakdown in trust between minority communities and police. Specifically, murder is spiking — in urban areas. Rosenfeld says last year in the country's 56 biggest cities, homicides jumped 17 percent. "That's a far larger percentage increase than in nearly any other year we've seen over the last couple of decades," Rosenfeld says. When there's a spike in the numbers like that, criminologists look to see if it correlates with other trends — such as a surge in the illegal drug trade, or a wave of ex-convicts getting released from prison. While both those things have happened in recent years, Rosenfeld's analysis shows the timing isn't right — they don't quite sync up with the spike in murders. But there's another potential explanation that does, what Rosenfeld and others call the "Ferguson effect." It refers to the August 2014 shooting death of an unarmed 18-year-old African-American man by a white police officer in Ferguson, Mo. Rosenfeld concludes in his study that some of the increase may be attributable to "some version of the Ferguson effect." Notice, Rosenfeld says "some version." That's because people disagree about what that effect is. It could be about police holding back, afraid they'll be criticized later for what they see as doing their job. Or you could look at it from the opposite point of view: that it's a matter of citizens — especially black people — losing faith in local cops. "When the perceived legitimacy of the police is in decline, community members take matters into their own hands," Rosenfeld explains. "Because they perceive that the police are simply not going to provide the kind of protection the community desires." Rosenfeld says he wants to see more detailed statistics. For instance, he wants to see if the month-by-month arrest records show the police holding back. The problem is, the FBI is painfully slow about releasing detailed national numbers. 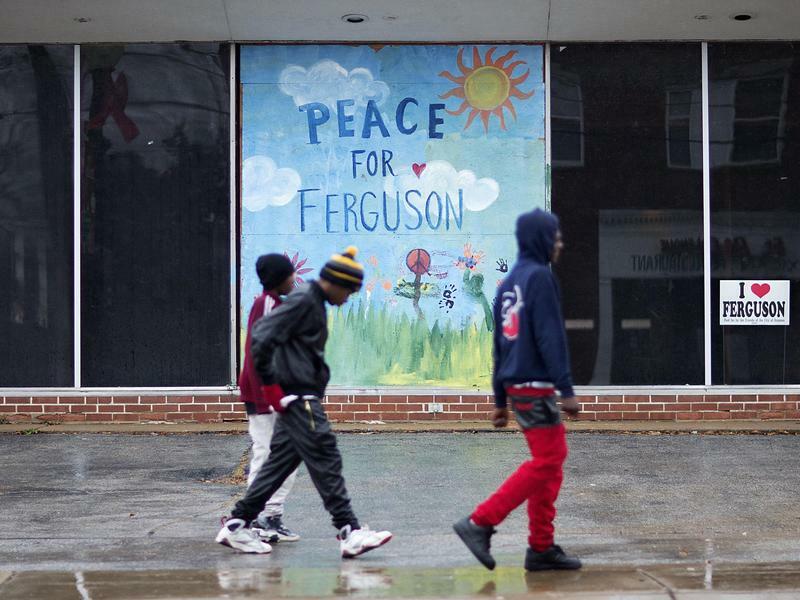 We may not get a complete view of the Ferguson effect until this fall — a full two years after Ferguson itself. Over the last year or so, the murder rate has jumped in America's big cities. And today, the Justice Department is releasing an analysis that suggests that some of that jump may be caused by what's come to be known as the Ferguson effect. NPR's Martin Kaste reports. MARTIN KASTE, BYLINE: The analysis was written by Rick Rosenfeld, a professor of criminology at the University of Missouri-St. Louis and a respected expert in crime trends. RICHARD ROSENFELD: We are in the midst of a very abrupt, precipitous and large crime increase. KASTE: Specifically, murder is spiking in urban areas. He says, last year in the country's 56 biggest cities, homicides jumped 17 percent. ROSENFELD: That's a far larger percentage increase than in nearly any other year we've seen over the last couple of decades. KASTE: When there's a spike in the numbers like that, criminologists look to see if it correlates with other trends, such as a surge in the illegal drug trade or a wave of ex-convicts getting released from prison. While both those things have happened in recent years, Rosenfeld's analysis shows the timing isn't right. They don't quite sync up with the spike in murders, but there is another potential explanation that does. ROSENFELD: Some version of the Ferguson effect. KASTE: Notice he says some version of the Ferguson effect. That's because people disagree about what that effect is. It could be about police holding back, afraid to do their jobs. Or you could look at it from the opposite point of view - that it's a matter of citizens, especially black people, losing faith in local cops. ROSENFELD: When the perceived legitimacy of the police is in decline, community members take matters into their own hands because they perceive that the police are simply not going to provide the kind of protection the community desires. KASTE: Rosenfeld says he wants to see some more detailed statistics. For instance, he wants to see if the month-by-month arrest records show the police holding back. 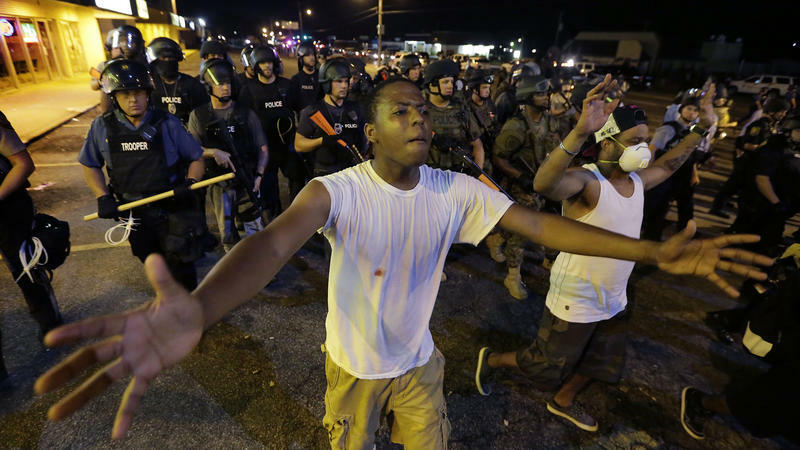 The problem is the FBI is painfully slow about releasing those detailed national numbers, and we may not get a complete view of the Ferguson effect until this fall, a full two years after Ferguson itself. Martin Kaste, NPR News. Transcript provided by NPR, Copyright NPR. I reunited with the Rev. Daryl Meese at his place of worship, a no-frills brick Methodist Church in Ferguson, Mo., on this stormy Sunday morning. We first met at a coffee shop last August. I was looking for a cool place to file a story about the protests over the death of an unarmed black 18-year-old at the hands of a white police officer; he was taking a break from the chaos. We shared a table and ended up chatting. 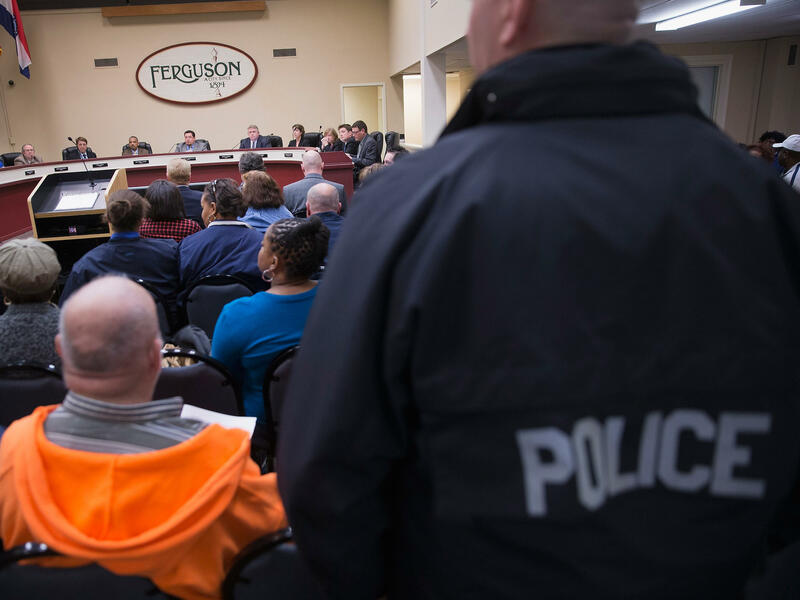 Three Ferguson, Mo., employees who were responsible for emails that contained disparaging references to President Obama and African-Americans are no longer employed by the city, Mayor James Knowles tells The Associated Press. Tear gas and Molotov cocktails were absent from the streets of Ferguson, Mo., last night, as protesters and police avoided the clashes that have marred demonstrations over the death of an an unarmed black teenager at the hands of a white police officer last weekend in the St. Louis suburb. Missouri Highway Patrol Capt. 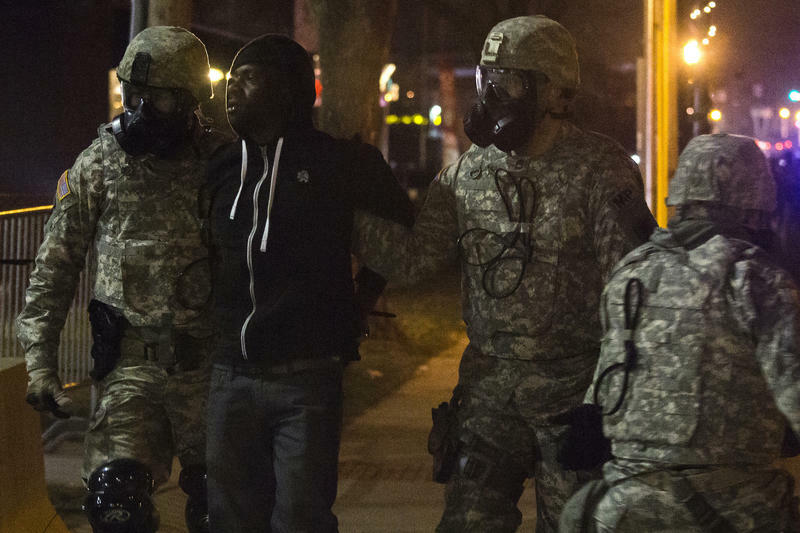 Ron Johnson, who is in charge of security in Ferguson, announced that 47 arrests had been made and that three loaded handguns were confiscated. Missouri Gov. Jay Nixon rejected a call today to appoint a special prosecutor in the Michael Brown case, the St. Louis Post Dispatch reported.